Deceuninck-Quick-Step rallies around Julian Alaphilippe to deliver the French phenom to another big victory this spring. The sprint was on in the Milano-Sanremo peloton. Deceuninck-Quick-Step pushed to the front with three riders in blue kit, leading out Julian Alaphilippe. The race wasn’t for the final finish, however, it was for the base of the decisive Poggio climb. Alaphilippe went on to win Saturday’s monument classic, and he said his team’s perfectly timed effort at the crux of the 291km race was the key to the biggest victory of his young career. Over the race’s three “capos” in the final 60 kilometers — small climbs along the Ligurian coast — things were under control in the peloton. 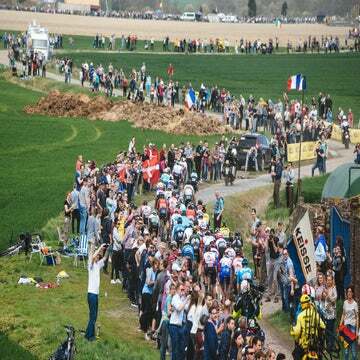 All eyes were on Deceuninck-Quick-Step, whose riders had won four major one-day races over the last month, including Alaphilippe who won Strade Bianche two weeks before. The Frenchman said his string of good form dated back to altitude training in Colombia earlier this winter. Although Alaphilippe was on flying form, many pegged his teammate Elia Viviani as the key rider for Sanremo. But after the route’s penultimate climb, the Cipressa, about 20km to go, it looked Vivani had given up on his chances. The Italian champion’s tri-color jersey drifted to the back of the bunch. Stybar and Gilbert rallied to set up Alaphilippe for the final climb. Alaphilippe said he wanted to put his teammates into the top-five at the start of the Poggio. He got that and much more with Stybar stringing out the peloton and Gilbert waiting in the wings. EF Education First’s Alberto Bettiol kicked off the action, attacking with Lilian Calmejane (Direct Energie) midway up the 3.7km climb. After one final pull by the former world champ Gilbert, Alaphilippe seized the moment and bridged up to the leaders. His work wasn’t quite done yet. With the finish line fast approaching, European champion Matteo Trentin (Mitchelton-Scott) surprised the final selection with a solo attack. Alaphilippe was quick to cover that move, still confident he had energy to sprint in the end. “We knew that Trentin was fast and so when he attacked I thought he could get away, so I made an effort to get on him,” Alaphilippe said. “That was good news for me, I realized that the other rides were on their limits. I stayed focused and then when I saw [Matej] Mohoric go, I knew it was the right moment. I got on his wheel and managed to finish it all off in the most beautiful way.